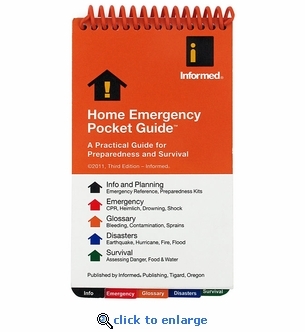 The Home Emergency Pocket Guide is an essential resource tool you can use to prepare and protect yourself, your home and your family. This emergency guide is packed with practical and helpful information you can reference in the event of any emergency or survival situation. This practical guide for preparedness and survival makes a great addition to your emergency kits at home or work. This pocket-sized emergency guide provides quick access to essential information on emergency first aid, emergency preparation and survival for storms, fires, earthquakes, floods, hurricanes and more. Info & Planning - Emergency Reference, Preparedness Kits.